1. Developing the capacity to create wealth through efficient and productive utilization of available resources, which in our modern age requires expertise in technology and management and the qualities and temperament of the entrepreneur. 2. Enabling each individual to find a gainful work which is in harmony with his/her natural temperament and capacities. 3. A culture of compassion, sharing and giving which leads to a voluntary redistribution of wealth, from the rich to the poor. 4. An economic, social and political environment which actively promotes, encourages and rewards creation as well as distribution of wealth. 5. A system of education which inculcates the above values. 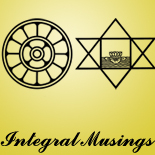 This entry was posted on October 14, 2013 by integralmusings in Education & Learning.